WIKA: Transistor instead of reed: As the first instrument of its kind, WIKA has launched a float switch with a PNP/NPN output signal. The model GLS-1000 detects the level of liquids with an accuracy of ≤ 1 mm. 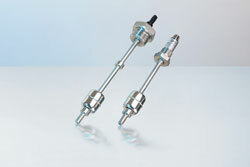 The digitised float measuring principle of the new WIKA level switch is implemented using semiconductor sensors. These enable an unlimited number of switching cycles. Users can define up to four switch points with a minimum distance of only 2.5 mm. Thus the instrument reacts to even the smallest changes in level. At the same time, the GLS-1000 can monitor the temperature of the medium via a temperature output with a Pt100/Pt1000 resistance. Even with the electronic circuitry, the digital float switch is also an economical measurement solution due to its similarity in design to its conventional counterpart. With the GLS-1000, traditional PNP/NPN limit level switches can now also be replaced by a float switch.